Road Rage II – B1 Power System – Fits ’86 – Up Softail Models – Features 2>1 Equal Length Stepped Industrial Chrome Head Pipes 1¾” – 1⅞” – 18mm O2 Ports For Factory Sensors – 18mm To 12mm Reducer And 18mm Plugs Are Provided – Straight Tube Chrome Performance Housing With 4” Black Anodized With Polished Billet Accent End Caps [BE40R] – 2½” dia x 11” long baffle [B2511] wrapped in woven roven fiberglass matt is removable and serviceable – Includes Full Coverage Chrome Heat Shields. Road Rage II – B1 Power System – Fits ’86 – Up Softail Models – Features 2>1 Equal Length Stepped Industrial Chrome Head Pipes 1¾” – 1⅞” – 18mm O2 Ports For Factory Sensors – 18mm To 12mm Reducer And 18mm Plugs Are Provided – Straight Tube black Performance Housing With 4” Black Anodized With Polished Billet Accent End Caps [BE40R] – 2½” dia x 11” long baffle [B2511] wrapped in woven roven fiberglass matt is removable and serviceable – Includes Full Coverage black Heat Shields. Road Rage II – Mega Power System – Fits ’86 – Up Softail Models – Features 2>1 Equal Length Stepped Industrial Chrome Head Pipes 1¾” – 1⅞” – 18mm O2 Ports For Factory Sensors – 18mm To 12mm Reducer And 18mm Plugs Are Provided – Short Chrome Megaphone Performance Muffler With 4” Black Anodized With Polished Billet Accent End Caps [BESMR] – 2½”dia X 10” long Baffle [B2510] Wrapped In Woven Roven Fiberglass Matt Is Removable And Serviceable – Includes Full Coverage Chrome Heat Shields. Road Rage II – Mega Power System – Fits ’86 – Up Softail Models – Features 2>1 Equal Length Stepped Industrial Chrome Head Pipes 1¾” – 1⅞” – 18mm O2 Ports For Factory Sensors – 18mm To 12mm Reducer And 18mm Plugs Are Provided – Short black Megaphone Performance Muffler With 4” Black Anodized With Polished Billet Accent End Caps [BESMR] – 2½”dia X 10” long Baffle [B2510] Wrapped In Woven Roven Fiberglass Matt Is Removable And Serviceable – Includes Full Coverage black Heat Shields. Firestorm – Stacked 1¾” industrial Chrome head pipes with straight cut 2½” housing – oxygen sensor ports and plugs – fits ’86 – UP Softail models – 2″ dia. x 12″ long baffle (B2012} wrapped in woven roven fiberglass matt is removable and serviceable – moderate exhaust level, louder than stock – includes full coverage Chrome heat shields. Includes: Slash Cut Polished Billet End Caps (BE40S) that can be rotated in 90˚ increments. 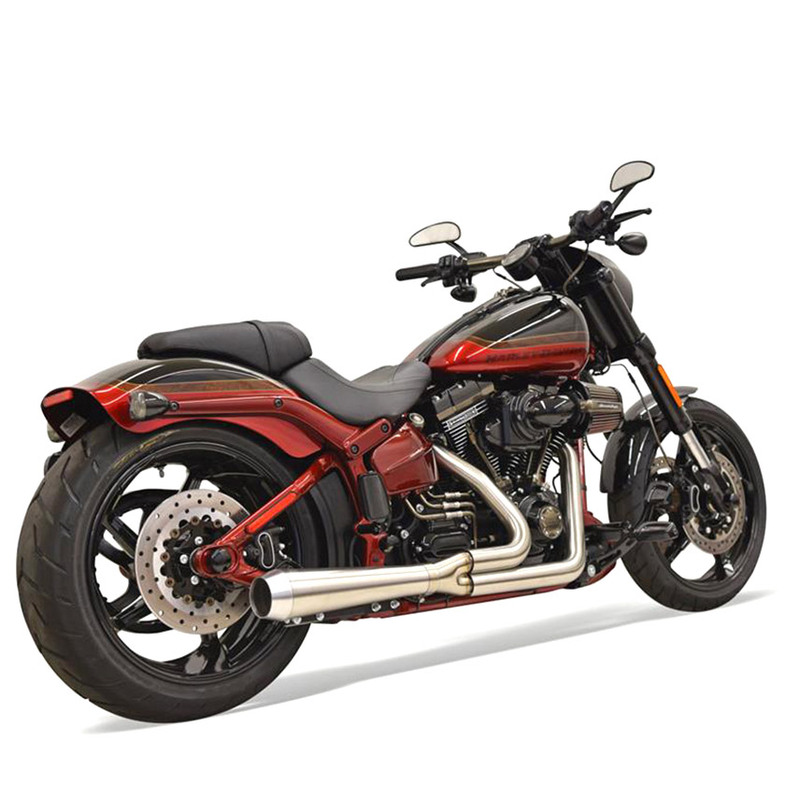 Firestorm – Stacked 1¾” black head pipes with straight cut 2½” housing – oxygen sensor ports and plugs – fits ’86 – UP Softail models – 2″ dia. x 12″ long baffle (B2012} wrapped in woven roven fiberglass matt is removable and serviceable – moderate exhaust level, louder than stock – includes full coverage black heat shields. Includes: Slash Cut Black Billet End Caps (BE40SB) that can be rotated in 90˚ increments. Firestorm – Stacked 1¾” Chrome head pipes with straight cut 2½” housing – oxygen sensor ports and plugs – fits ’86 – UP Softail models – 2″ dia. x 12″ long baffle (B2012} wrapped in woven roven fiberglass matt is removable and serviceable – moderate exhaust level, louder than stock – includes full coverage Chrome heat shields. Includes: Black Billet End Cap with Machine Flutes (BE40T). Firestorm – Stacked 1¾” black ceramic head pipes with straight cut 2½” housing – oxygen sensor ports and plugs – fits ’86 – UP Softail models – 2″ dia. x 12″ long baffle (B2012} wrapped in woven roven fiberglass matt is removable and serviceable – moderate exhaust level, louder than stock – includes full coverage black heat shields. Includes: Black Billet End Cap with Machine Flutes (BE40T). that allow these to fit, all of the following models! Firepower Series – Softail Replacement Mufflers – Fits ’07 – UP FXSTB, FXSTC, FXCWC, and FLSTC – 3″ Slip on Chrome Muffler with Slash cut tip (top longer) – 2″ dia. X 14″ baffles (B2014) wrapped in woven roven fiberglass matt are removable – moderate exhaust level, louder than stock – mounts on to stock brackets and uses stock hardware. Firepower Series – Softail Replacement Mufflers – Fits ’07 – UP FXSTB, FXSTC, FXCWC, and FLSTC – 3″ Slip on Chrome Muffler with Bologna cut tip (rear longer) – 2″ dia. X 14″ baffles (B2014) wrapped in woven roven fiberglass matt are removable – moderate exhaust level, louder than stock – mounts on to stock brackets and uses stock hardware. Firepower Series – Softail Replacement Mufflers – Fits ’07 – UP FXSTB, FXSTC, FXCWC, and FLSTC – 3″ Slip on Chrome Muffler with a Grooved Polished Billet End Cap – 2″ dia. X 14″ baffles (B2014) wrapped in woven roven fiberglass matt are removable – moderate exhaust level, louder than stock – mounts on to stock brackets and uses stock hardware. Firepower Series – Softail Replacement Mufflers – Fits ’07 – UP FXSTB, FXSTC, FXCWC, and FLSTC – 3″ Slip on Chrome Muffler with a Grooved Black Anodized Billet End Cap – 2″ dia. X 14″ baffles (B2014) wrapped in woven roven fiberglass matt are removable – moderate exhaust level, louder than stock – mounts on to stock brackets and uses stock hardware.